I have to laugh at the situation here in Germany. The advertisement campaign for Camel cigarettes was never so good or influential as it is over here. I have taken it on as a hobby to build a photo album of these ads on my website. Seemed like a good thing to entertain everyone. I had a recent windfall of pictures, so this should be a lot of fun for a while. Next to each ad is a translation of the ad's text. I always have my eyes open for new ads. Enjoy, but don't start smoking!!! There is no replacement for a Camel. Nothing is sexier than lipstick on a Camel. You can always hang around with a Camel. Already "had" a Camel today? Don't let your Camel go bad. A Camel always fits in. Don't throw a burning Camel out the window. Don't sit on your Camels. It's funny, someone always steals your last Camel. Always have a Camel afterwards. Nothing is better that the first Camel of the morning. Never light a Camel at a gas station. Don't let your Camel get wet. Have you packed your Camels? Nothing's better than a pair of Camels at night. Don't leave your Camels alone up at the peak. Don't leave your Camels laying around everywhere. Wow! Still a Camel in the jacket! Camels are unbeatable. (love those 5 Aces) You never forget your first Camel. Camels leave prints behind in the snow. Always have a Camel at hand in your car. Don't forget your Camels in the coat closet. Camels are simply tempting. Throw me over another Camel. There is another Camel already waiting at home. Like magic - the last Camel is gone again. Nothing is nicer than a Camel at night. There is always time for a quick Camel. 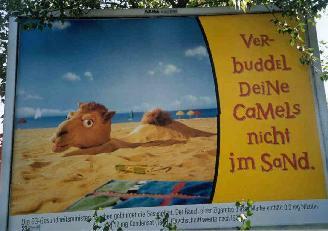 Don't stick your Camel in the sand. A Camel comes better without chewing gum. Watch your Camel closely.